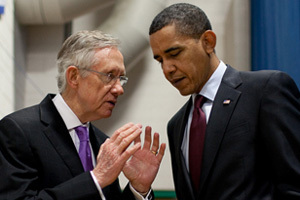 Where Was Obama When Reid Killed the Climate Bill? Plus: What’s left in the Dems’ sorry excuse for an energy package. Two MoJo reporters take on today’s climate news: First, Kate Sheppard on the death of the climate bill—and what’s left in the Dems’ measly energy package. 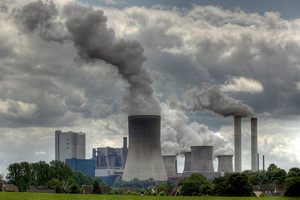 Then, Josh Harkinson on Obama’s role in the carbon cap’s untimely demise. davipt/FlickrJust got confirmation from several Senate offices about what is actually going to be in the package Democrats put forward next week. In a nutshell, this is going to be a very tiny package, with little in the way of energy measures. I’m not even sure you can call it an energy package at this point. 1. Oil spill response measures, including elimination of the liability cap for damages and granting the power of subpoena to the presidential oil spill commission. 2. Reforms to the Department of Interior division charged with overseeing oil and gas development, likely similar to the package Sen. Robert Menendez (D-NJ) has proposed. 3. $5 billion to spur the development of a natural gas truck fleet. 4. $5 billion to fund the HomeStar program, which will encourage construction of energy-efficient homes. 5. $5 billion for the Land and Water Conservation Fund. And that’s it. Obviously, there’s no carbon cap, that much we already knew. But there’s also no other major energy efficiency standards, and, perhaps most importantly, no renewable electricity standard –not even the weak one included in the energy bill last year. A Senate Democratic aide tells me that leadership backed off including a cap, which they thought would become the focus of Republican opposition in the absence of the much-demonized carbon cap. Senate aides hoping to put a positive spin on the package note that it at least does not include any of the really bad measures that progressive senators were worried about, including major incentives for coal and nuclear power and the elimination of the Environmental Protection Agency’s ability to regulate greenhouse gases. It is also a package that Democrats are expected to support uniformly. Handled correctly, the BP spill should have been to climate legislation what September 11th was to the Patriot Act, or the financial collapse was to the bank bailout. Disasters drive sweeping legislation, and precedent was on the side of a great leap forward in environmental progress. In 1969, an oil spill in Santa Barbara, California – of only 100,000 barrels, less than the two-day output of the BP gusher – prompted Richard Nixon to create the EPA and sign the Clean Air Act. But the Obama administration let the opportunity slip away. Placing a limit on global-warming pollution and accelerating the deployment of clean energy technologies is the only truly effective long-term solution to this crisis. Now it is time for the Senate to act. In the midst of the greatest environmental disaster in our history, there is no excuse to do otherwise. Of course, there’s always an excuse in Washington. Voting for a climate bill might hurt the reelection prospects of swing-state Democrats. The Senate, exhausted in the wake of its tough votes heath care and financial reform, might have never overcome a filibuster. And, to be fair, Obama has already done more for the climate than any president before him. But no matter: The confluence of a huge Democratic congressional majority and a huge ecological catastrophe wrought by the fossil fuel industry could have presented a once-in-a-generation opportunity to rewrite the rules of climate politics. With a little bit of leadership. Unfortunately, a little bit of leadership on the climate is more than we’ve got right now. A Climate Bill, But at What Cost?